The children have been exploring transient art. 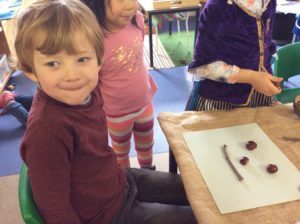 This involves manipulating and exploring different materials to create pictures. This is a non permanent form of art that encourages the children to work on their own or collaboratively. We have had some lovely patterns and designs. 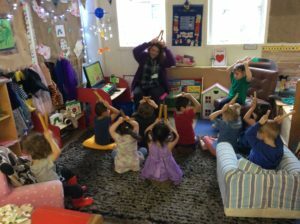 This week we have introduced tap sticks to some of the songs we do at nursery. 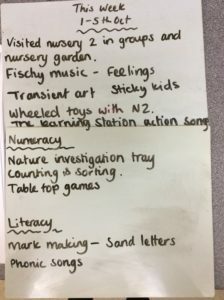 This was well received by the children and they tapped out rhythms to baby shark, Herman the worm, ram Sam Sam and the sticky kids tap stick song. 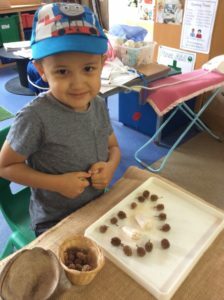 We have been so impressed with show and tell on a Friday. 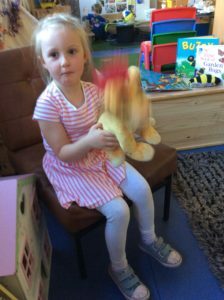 The children have been confidently talking in front of their friends about the toys they have taken in from home. This is great for encouraging their language skills and is helping them develop their awareness of when to talk and when to listen. We now have a weekly activity log on the door as you leave so please feel free to have a read at your leisure. 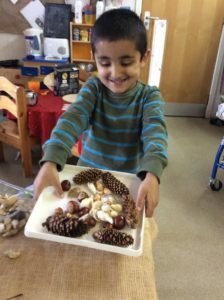 There are always exciting things happening at nursery. We will be having a Halloween party on the 31st. The children can come in fancy dress but this is not compulsory. We will carve pumpkins have party games and make Halloween crafts. We hope you all have a great October break!